We were extremely lucky to get the chance to speak to Boba Fett at the amazing community Star Wars weekend at Wallasey Spaceport. Thank you to everyone from the Church of Jediism and Comic Conventions who submitted questions, and a little thanks to my brother for asking a few too! CC:How did it feel to get kicked into the Sarlacc? Boba: It felt unnecessary, they even added a burp which was okay for the humour but I don’t like that in Star Wars much. CC: Did they actually tell you Boba escaped the Sarlacc? Boba: Yes, I thought he should from the start he was too smart, he would just jet pack out. I’m glad George made him get out. CC: Apparently George Lucas said he would have kept Boba alive if he knew how fan-loved he would get, what do you think of that? Boba: Nah, I think he just wanted him dead. CC: How was it in the actual Sarlacc? Boba: It was good, had good gambling. I was quite shocked that Boba Fett didn’t start up a casino down there, would have been a blast. Boba: Yeah, Sarlacc Central, perfect! CC: You really perfected the role, you didn’t work from a script but used Clint Eastwood as inspiration in a way, what do you think helped with that? Boba: The costume spoke words, obviously I put a lot of effort in to the role and it was my own ability, a costume can’t do it all. But the costume really worked well. Clint and Boba are the same in a way. When he smokes the cigar casually, and then suddenly strikes, it was amazing. Perhaps not the best for kids, but it was a really good performance, he was always ready. CC: What do you most admire about Boba Fett? Boba: He’s very fair…He tells people before he blasts their head off. CC: So he’s kind of polite about it? Like an old English Gentleman? CC: You said the Jet pack was heavy and awkward, would it be better if it was real? CC: I probably should have asked that in a different way? Boba: Yeah probably! No don’t worry, it was weird, it took you off balance, and you like to be firm on both feet. It weighed your back down, took you off balance (At this stage he sort of showed how he tried to stand) The jet pack sort of clicked in, and immediately you could feel yourself falling back. CC: How did you feel about them not hiring you for the extra bits in the Special Edition? Boba: It would have been nice, but I would have said no. He has hold of women in the bar, I would not have done that. Because he was vulnerable, that’s not what Boba is about, he’s smart, always ready. He knows people don’t like him, so he would be on guard. CC: Boba Fett doesn’t really say much, do you wish he had more to say or? Boba: Return of the Jedi, where all the Ewoks are having a little party, and it pans around, it should keep panning and you see a little glint from Boba Fetts helmet. CC: Do you like Gadgets and technology? CC: The rocket firing Boba Fett has become one of the rarest figures in the Star Wars universe, to the point people don’t think it exists, but it does. I have one. How does that feel? Boba: It amazes me to see collections and how much people will pay, I have a modest collection. I have a bronze statue of Boba Fett, it’s kind of weird. Some of the stuff is good, silly, but good. CC:What do you personally like about Star Wars? 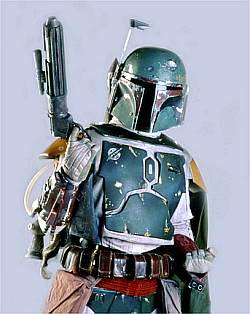 Boba: It’s kind of gentle, it’s violent but it’s a fantasy squash-buckler violence. I mean there are some really violent video games now, and Star Wars was never like it, it was violent and people died but blood didn’t squirt everywhere. CC: How did it feel going from Boba to Colton? Boba: I was honoured to be asked, I’m tied into the whole Saga because of it. And his first name is a mix of my first and last names (Jeremoch). At the same time though I hated the new films, they were too silly. They could have pulled it together if Jar Jar turned out to be an amazing soldier or warrior, but he wasn’t. CC:What do you think is the worst film you have been in? Boba: Well every actor has a shameful film, mine was “Keep it up for a week” it was a poor comedy about someone not being able to keep a job for a week. I played the main role. It was a little raunchy but more like carry-on, not flat out pervert-ism. CC:And the best film you’ve been in? Empire Strikes back, right? CC: And finally, what do you think of the Church of Jediism? Boba: It’s interesting, they should make Fettism.